Apical pore field—area of small pores at the apices of the valves; the pores are usually arranged in longitudinal rows, otherwise similar to the ocellus of the centric diatoms. Apical slit field—area of elongate pores (slits) at the apices of the valves; the pores (slits) are separated laterally by long bars. Foot pole (basal pole) and head pole (apical pole)—mainly used for cells in stellate, radiating, and bundle-shaped colonies in which neighboring cells are joined by valve faces of the foot poles; head pole is the other cell end. Sternum—an elongate part of the valve where areolae are sparse (relative to the rest of the valve) or missing and which is often thickened pervalvarly (Mann 1978, p. 27); here used for the former pseudoraphe or axial area. 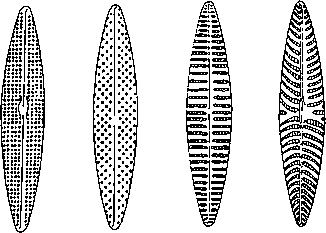 abed FIGURE 17 Valve striation in pennate diatoms, (a) Parallel striae; (b) radiate striae; (c) lineate, parallel striae; and (d) lineate, radiate striae. margin toward the center of the valve (Figs. 17b and 17d). Convergent striae are inclined from the valve margin toward the apex. Lineate striae are crossed by finer longitudinal striation (Figs. 17c and 17d). Whereas the pores and the slits will hardly be seen, the presence of an apical field is often recognized with LM as an open area lacking any resolvable structure. 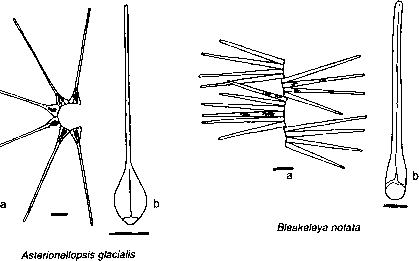 The family is poorly represented in marine phytoplankton; Asteriotiellopsis glacialis and A. kariana may be the only species dealt with in this chapter that may be characterized as being truly marine planktonic. It should be noted that A. glacialis also occurs in the surf zone communities (Lewin & Norris, 1970). Striatella is attached to a substratum by a mucilage stalk although it is often found in plankton collected close to the coast, as is also the only Fragilaria species mentioned in this chapter. Synedropsis hyperborea is fairly common in Arctic plankton but, like other Synedropsis species, it may be more common on ice and as an epiphyte on other diatoms, especially on Melosira arctica (Syvertsen, 1991, Table 1). One labiate process near one or both apices. One apical pore or slit field at each apex. Uniseriate striae of poroid areolae. Synonym: Asterionella japonica Cleve in Cleve & Möller. 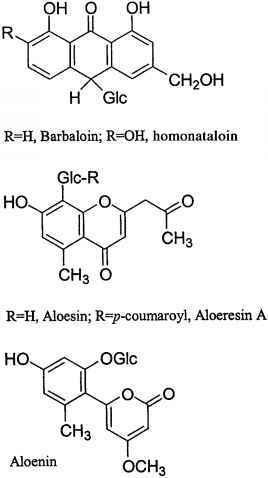 References: Cleve & Möller, 1882, p. 3, No. 307; Cleve & Grunow, 1880, p.
Cells with dissimilar ends in valve as well as in girdle views. Cells joined by valve faces of expanded foot poles in star-like, spiral chains. Foot poles angular in girdle view and more or less rounded in valve view. Apical pore or slit fields (EM). PLATE 50 Asterionellopsis glacialis: (a) chain in girdle view. Scale bar = 20 /im; (b) valve view, with apical field and sternum indicated in head pole. After Cupp (1943). Scale bar = 10 fxm. Asterionellopsis kariana: chain in girdle view. Scale bar = 10 ju.m. Bleakeleya notata: (a) chain in girdle view. Scale bar = 20 /um; (b) valve view, with sternum and apical field. After Hustedt (1959). 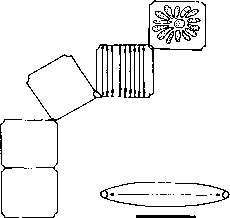 Scale bar = 10 p.m. Striatella unipunctata: (a) chain in broad girdle view, with chloroplasts (top cell) and septa (second cell from top); (b) valve view, with sternum, apical labiate processes, and pore fields. Scale bars = 20 p.m.